I frequently recommend Karen's Pilates classes to friends. 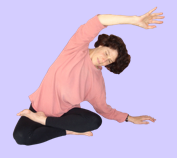 Her classes are small, and she brings to them the eye of a body worker, coaching and educating each person in terms of his or her own specific needs. Pilates can be very intense as well as effective, and Karen's classes avoid the dangers of self-injury that are so often present in large classes with instructors who are well-meaning but unable to really observe each individual's process and progress. Her enthusiasm for learning and sharing her information about the body and how it functions and what it needs is contagious. 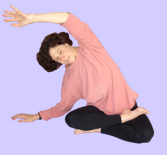 Karen's class is a great opportunity to challenge yourself safely at your own pace. My experience in exercise classes has been that the teacher pushes me and I often injure myself. Karen's format innately prevents that from happening. In the rare situation that the exercises are too much there is no pressure to keep up with the class. The atmosphere is warm and safe for taking care of my body. The strengthening exercises are safe for the body and do wonders for my core strength. It is noticeable in how my clothes fit too. We went to Karen when we were in our mid-fifties, out of shape and not knowing how to get started to turn the situation around. Our goal is to age well and to be able to remain healthy and active into our retirement. Karen has always been extremely patient and accommodating. She adapted her teaching to our needs and our time with her has made a tremendous difference. We're stronger, our balance has improved, and we are healthier. We also enjoy our time with Karen: her great stories, her sense of humor and her health tips. We would highly recommend Karen to anyone who wants to become a healthier and stronger person.